Oftentimes, customers are replacing the tires on their machine in an effort to fix a trait that they are dissatisfied with; for example, they want to increase traction, minimize soil compaction, or enhance roadability—which is why my first question is always, "what are you trying to accomplish by equipping your tractor with new tires?" With just the knowledge of the customer’s desired end result, I can normally whittle a long list down to a few good options. What type of machine are the tires for? Picking the right set of tractor tires is largely about knowing your terrain and machine. Because of this, the next questions I ask customers are (i) what type of tractor they have and (ii) what type of terrain it is operating in. Will the tractor primarily operate on flat ground or will it be running on hillsides? Is it going to be used exclusively in the field or will it be driven on the road as well? These are just a few of the questions that help me further filter down tire selection. Of course, I also question whether what we are asking the tire to do is reasonable. By knowing what type of machine a customer owns and the application it’s being used in most often, I can easily research the horsepower and capacity of the tractor and discover if it’s up to the task. Although tires will help a customer’s machine reach its performance potential and transfer its horsepower to the ground, they can’t add horsepower to the engine. What tires came on the tractor from the manufacturer? After ascertaining the basic information—desired outcome, type of tractor, terrain, and application—I look up what the original equipment (OE) tire specs are. Knowing the OE spec, I search through the ATG catalog and look for what we have that is close to the tractor’s original tire spec as long as it will still fit the customer’s objective. Over the years, I’ve been asked to help pick out tires a lot, which has led me to create an Excel spreadsheet that makes this fast—but anyone with a little free time can scroll through ATGtire.com or our digital catalog and find what they’re looking for. Often, after this step, I will have narrowed my list to four or five tires that will be well-suited to a customer’s needs. If, for some reason, ATG doesn’t have an Alliance, Galaxy, or Primex tire for the customer at this point, it’s my job as a product manager to decide if we (and the market as a whole) are missing an opportunity. It’s also another way that ATG is helping solve the real-world issues facing our customers. In the past, this process has led to the development of new tires as well as additional sizes of current offerings. An added benefit of the direct customer contact in this process provides a potential survey customer and sounding board for the design process also. With my list narrowed down to four or five tires, I can begin to play with tire sizes to help the customer achieve their desired outcome while always considering if the width of the tires will fit the tractor and making sure the front-to-rear tire ratio is providing a positive lead between +1% and +5% on an MFWD tractor—in other words, ensuring that the front tires run just 1% to 5% faster than the rear ones. In a perfect world, I prefer to find a tire that provides a positive lead close to 3%. It’s incredibly important to size tractor tires correctly. On MFWD tractors, the front wheels rotate slightly faster than the rear wheels to help assist the tractor through the field. However, if the front tire is too short, the rear wheels end up pushing them which tears up the tires and wreaks havoc on the tractor’s driveline. Alternatively, too-tall front tires will bind up the tractor’s driveline and quickly create mechanical problems. When selecting tires for an MFWD tractor, I always start with the rear tire and match the front to it. Because of the negative ramifications of installing an incorrectly sized tire, consult your local dealer if you have any doubts about sizing. 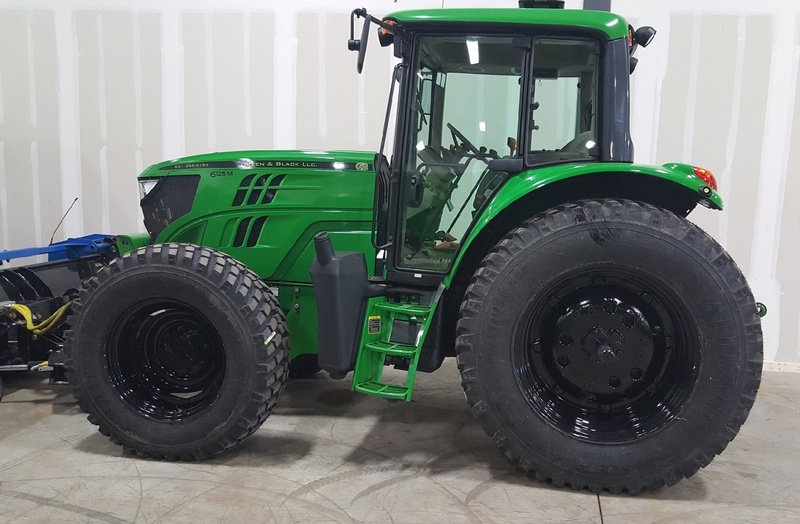 On articulating 4WD tractors, matching tires is a lot simpler, although it’s still extremely important to maintain the correct ratio (1:1) between the front and rear tires—failure to do so can result in major (and expensive) damage to the drivetrain. It’s also worth noting that 4WD tractors almost exclusively use tires with the same tread pattern on both the front and the rear. If you know anyone who has tried to get away with replacing just the front or back tires on their old 4WD pickup, you know the damage mismatched tires can cause to a 4WD system. Because proper tire sizing is so important to the performance of your tractor, take the time to calculate the proper front-to-rear ratio on your MFWD tractor using this equation: the rolling circumference of the front tire, times the inter-axle ratio (the number of rotations the front tire makes in relation to the rear tire), divided by the rolling circumference of the rear tire. The inter-axle ratio (IAR) can be found by asking a service tech at your local implement dealer. If I was writing the equation on a blackboard it would look like this (RC front x IAR)÷RC rear=lead/lag percentage. In the end, you want the calculation to equal a positive lead between 1% and 5%, and ideally you'll find a tire with a positive lead around 3%. This is also another instance where your local dealer can be a great resource, as these calculations can be difficult, especially for those that don't make them all the time. When dealing with a 4WD tractor, make sure to look up the rolling circumference of the replacement tires and compare them with the specs of the original equipment. As always, if you have any questions, reach out to your local dealer or contact your ATA representative. We say it all the time: tires are vital to the productivity and efficiency of your tractor. When it’s time to replace your tractor’s tires, choosing the right set can help with everything from increasing tractor performance to reducing soil compaction and optimizing fuel efficiency. While we hope you find this guide useful, your local Alliance Farm Tire dealer is also a great resource, so don’t hesitate to reach out to them when it’s time to buy new tires. In fact, bring this guide along when you visit your dealer to know the right questions to ask when buying your next set of tractor tires. 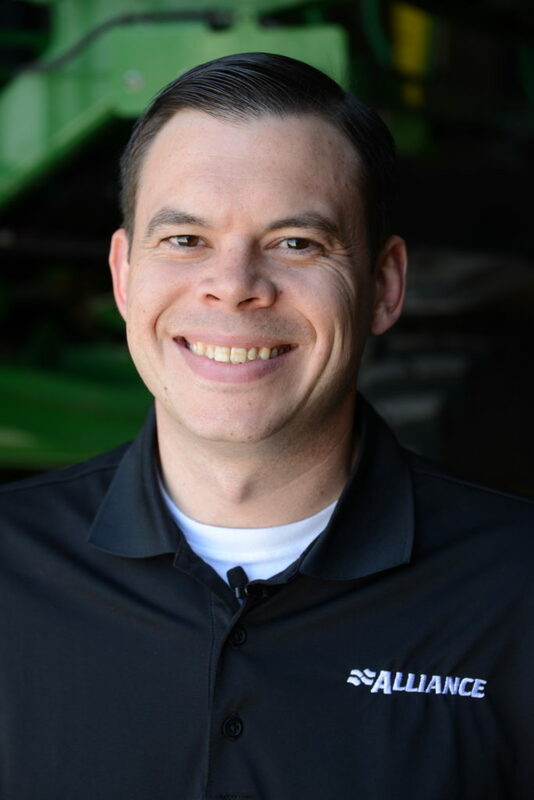 After nearly a decade of working with ag tires, self-proclaimed farm boy, James Crouch is living the dream as ATA’s National Product Manager for Agriculture. On any given week, James can be found in the field educating customers on the benefits of choosing the correct tire, traveling to train employees, or coordinating with ATG’s international teams to keep them apprised of happenings in the North American market. Occasionally, when James isn’t thinking about tractors and combines, he writes about them for us here on The HUB.